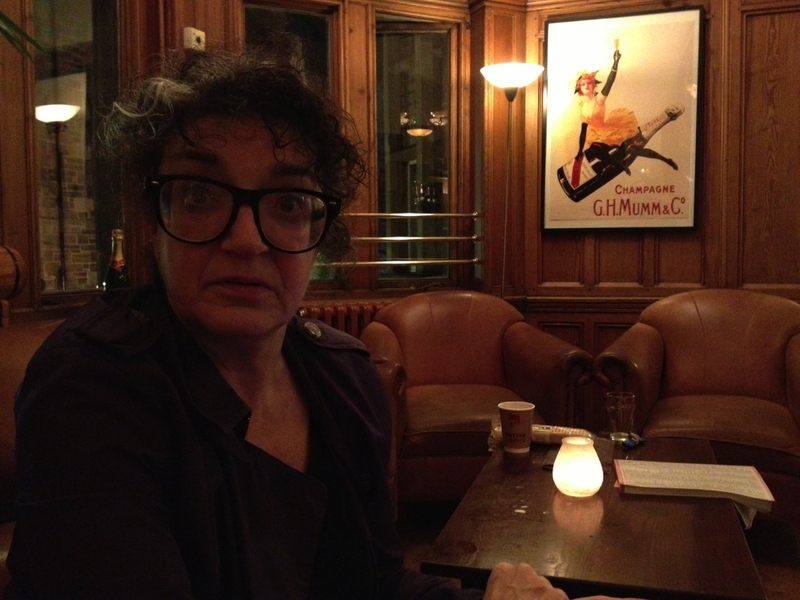 At the Edinburgh Fringe last night, I had a brief chat with Kate Copstick, doyenne of Fringe comedy critics. Next week, Monday-Friday, I am chairing a chat show – So It Goes – John Fleming’s Comedy Blog Chat Show – at the Fringe. First guest on Monday will be Arthur Smith; last guest on Friday will be Adrienne Truscott, possibly the most talked-about act at this year’s Fringe. 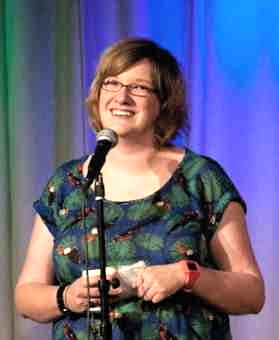 Kate Copstick will be on the show daily with her shows-to-see tips and her always forthright views on Fringe people. Copstick is nothing if not forthright. And it can sometimes get her into trouble. “Apparently I’m getting incredible hate male on Yahoo,” she told me last night. “I’m quite excited, really. “The first day I arrived in Edinburgh, I did an interview with Russell Kane on this Fringe in 5 thing on Yahoo – little five minute chunks of interview, mainly with famous comedians. It’s still online. “I got a call from Avalon (the comedy management company) saying it had all gone a bit crazy. Most of the interviews were getting around what David Baddiel got – 15,000 views – but the interview they’d done with me had got 100,000. “I thought Oooh, lovely, but couldn’t remember what I’d said. We’d gone way over, with me yacking on forever but, apparently, the problem was things I’d said about Sarah Millican. All hell had broken loose, on account of the ‘sisterhood’ getting their tampons in a twist. “I couldn’t remember what I’d said, but it was a throwaway remark. “Avalon called me back in to do another Fringe in 5 and Emily Dean, the girl who’s with Russell, said she was quite offended and “tens of thousands” of women had been equally offended “on behalf of other women”. Not just women in comedy, but women in general. Though especially women in comedy. “Apparently I had said something like Oh, if Sarah Millican wasn’t a Geordie, she’d just be told to go away, lose some weight and come back when she was funny. “Self-evidently, that’s just a daft, off-the-cuff remark. I mean, she’s not even really fat. She’s really not – she’s little and cuddly. “But apparently the problem was that I’d dared to mention something physical about a woman in comedy. Apparently you’re not allowed to. “You’re not allowed to say – I don’t know – presumably anything… Big, Blonde, Fat, Thin, Old, whatever. “Absolutely!” she interrupted. “Of all the offensive things I’ve said… And Emily Dean said to me Do you want to apologise for it? “Obviously and genuinely, if I thought for one second that Sarah Millican was in a corner crying, I would apologise wholeheartedly to her… But I’m not going to apologise to the bloody sisterhood in general for, in principle, transgressing the unwritten laws of irritating women. “It’s crazy!… I got really very pissed-off with the oestrogen-raddled, pathetic small-mindedness of it all. “I half thought about deliberately including highly personal comments about everybody I review now. “Oddly enough, I’d just written a review about a comedian called Bobby Mair, who is clearly the heir to Doug Stanhope. I said the first thing that strikes you as he walks on stage is you can immediately hear, in your mind’s ear, the theme tune of Duelling Banjos, cos that’s what he looks like. I said he looked like an unmade bed. And then I switched off my iPhone recorder. The Edinburgh Fringe is all about promotion. 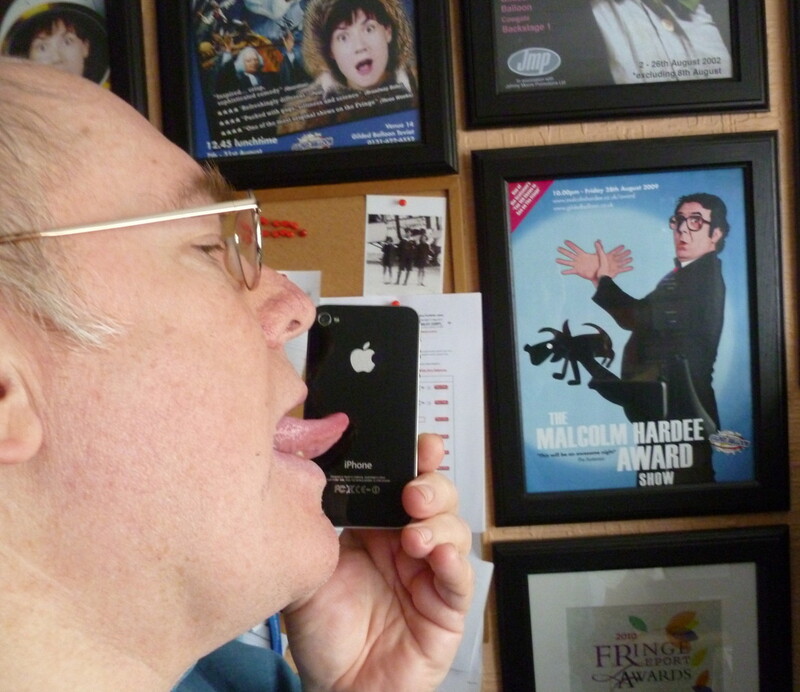 Who says you cannot lick a new Apple product ??? I have never bothered with a smartphone before, but I got an Apple iPhone 4s yesterday because I think it might help me understand how to use Twitter (which I never have) and because it means I do not have to buy a new iPad to get 3G coverage – I can just tether my iPhone to my old non-3G, WiFi original Apple iPad. You will gather I like Apple products. I also have an iMac and a MacBook Pro. I first bought a computer in 1989. It was an Amstrad. I bought my first Apple Mac in 1993. I have never bought a Windows PC. A prime example of why is what happened to me in Ireland. It was my first day working on a contract at the late Tara TV in Dublin; they had PCs using the then-new Windows 98 operating system. I was the last and only person in the office in the evening. When I had finished, I tried to shut down my computer. I could not find any way to do it. There was no on-screen button anywhere. Eventually, I had to phone a friend in England and ask how to switch off the system. “You click the Start button,” she told me. This seemed to me to epitomise Microsoft products. In order to shut down the computer, you had to click the Start button. It was the only way to do it. You had to know the rules and follow them. I once heard a Microsoft executive proudly say they had done market research into what people wanted in their computers and found that most of what people wanted but said they did not have was already in the Windows operating system. He took this as an example of how good the system was. I took it as an example of how Byzantine the system was. People had no idea how to find or do anything. 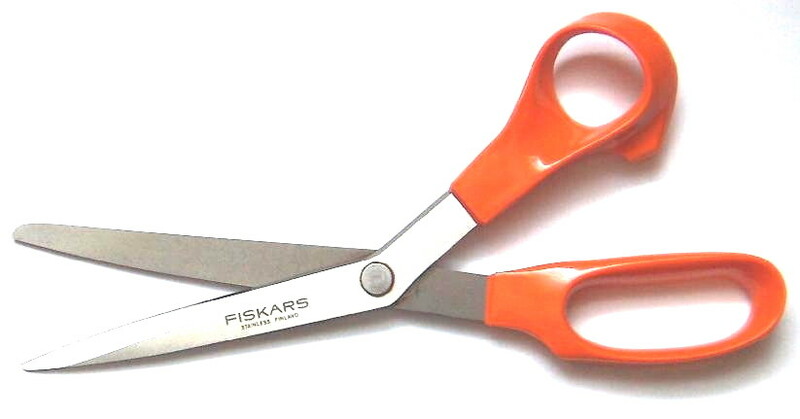 The difference between Apple and Microsoft Windows products has always seemed to be that Windows works in a certain way and you have to follow the rules to do anything. Apple computers really are intuitive. If you want to do something, you think, “How would I do that?” and you can probably do it the way you think you can. But there may be five other ways to do the same thing, because different people think differently. Apple designs with the user in mind. Setting up my new iPhone yesterday was simplicity itself, because everything appeared on screen logically, simply and in plain English, not in nerd-speak. In that way, I think it is like writing. People who sit down to write thinking “I want to say something. I have an empty page. What am I going to write on it?” may tend to write badly. There used to be a television ad for a tinned fish supplier which had the selling line: IT’S THE FISH JOHN WEST REJECT THAT MAKE JOHN WEST THE BEST. It is keeping an eye on what you exclude – even more than what you include – that makes a difference to the end product. Good writing is created by a writer who looks at it from the viewpoint of the reader not the viewpoint of the author. Good comedy is created by a comedian who looks at it from the viewpoint of the audience not the viewpoint of the comic. Good computer operating systems and programs are created by nerds who look at them from the viewpoint of the user not the viewpoint of the nerd. That is why I buy Apple computers.